Everything starts with a craving. The story goes something like this: I woke up one day, and found myself craving for tonkatsu, or more specifically, Katsu Sandwich. I was suddenly reminded about Romankan Yokohama, this Japanese eatery in the basement of Ngee Ann City. Even though there’s always Tampopo Japanese restaurant, Tonkichi Katsu, Tetsu Japanese restaurant, or even Tonkatsu Ginza Bairin in Orchard, I was trying to look for an alternative to the best tonkatsu in Singapore. Well, I don’t want to get too comfortable and always go back to the same few places to satisfy my katsu lust. What happens if all of them closed down one day? I need a backup plan, a new Japanese restaurant that can give me the same good old katsu. For a rather isolated place, Romankan Yokohama seemed to be doing fairly well. I wanted to order their Katsu Sandwich. But after taking a glance at the few katsu sandwiches (they looked unappealing: thin & dry) which were made in advance, I decided to go for the Rosu Katsu ($13) instead. Sadly, I wasn’t impressed with the tonkatsu too. Outside, it was fried all right, with a shattering crunch when I took a bite. But inside, it was slightly dry, and wasn’t juicy enough. But I guess we shouldn’t complain, since the prices of tonkatsu at places like Tampopo or Tonkichi would easily be $20 (before taxes). If you are coming from the direction of the Takashimaya Food Hall, go all the way in until you see Fisherios Fish N Chips – Romankan Yokohama is hidden right at the corner. 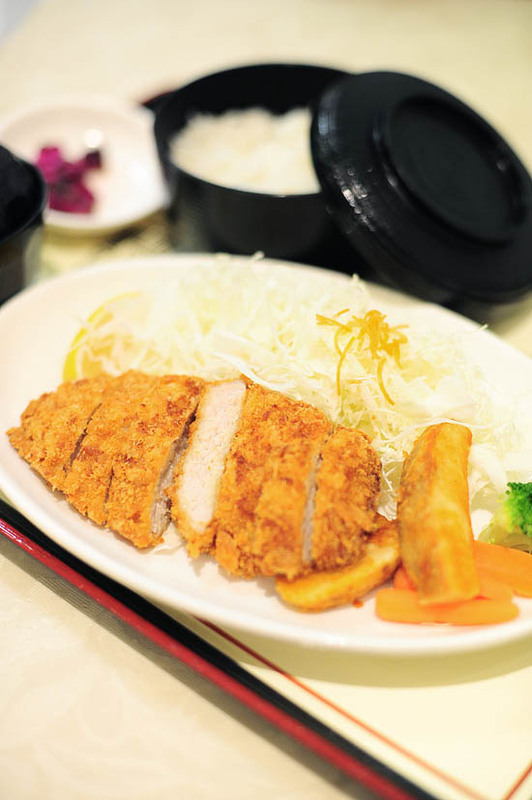 The katsu isn’t spectacular, but the prices are definitely much more affordable. It is also a rather nice place for a quiet dinner at Ngee Ann City. Are there any regulars of Romankan Yokohama here? What do you usually order when you are there for dinner? Just the other day I had the tonkatsu ramen from Tampopo. Surprisingly, I liked that better than their famous spicy black pig ramen. try the curry! Have not been there for very long, dont know about the standards now.. I think the pre-prepared sandwich is for takeaway.. The sandwich is ok.. I love their curry! With bits of pork, potato and carrot, it’s more ‘homemade’ than most japanese curry i’ve tried. The other tonkatsu place i love is Tonkichi, the succulent oysters are to die for, and i love how you grind your own sesame to your liking as the dip. talking about it makes me soo hungry! I used to like this place a few years ago & I ate there almost once a week. Looks like their standard has drop. The katsu sandwich is by far their best, you should definitely try it! I agree, their curry used to be really good. I frequent there after my Japanese lessons every week last time. But still my mom’s favourite is their sandwich set, with their coffee. The coffee is really good but ala carte it’s about S$4. We would usually order that and for myself I’d get the curry set, or Rosu Katsu as it’s less dry. If you just order the fried items, try to request for mayo or dip the tonkatsu sauce instead. Anyhow, I still think it’s affordable and good for a casual meal. !